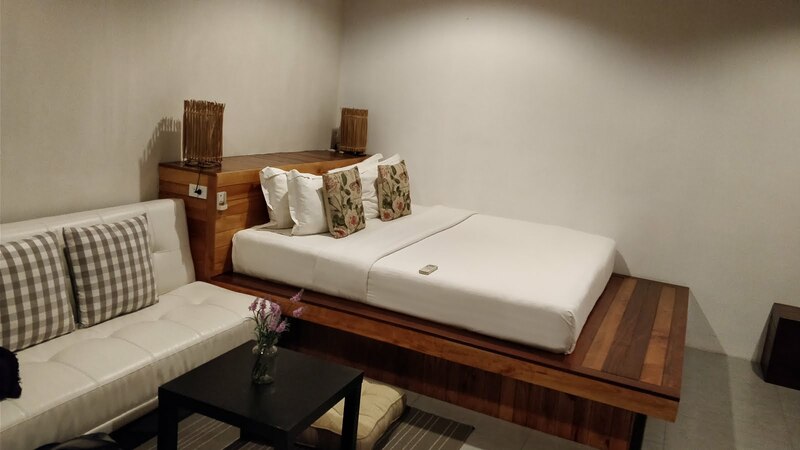 Getting from Patong Beach to Ko Pha Ngan involved a long day of travelling via taxi – bus – ferry – taxi, and we had decided to book this through a tour company based in Patong to save a few hundred Bhat. We had booked this on the understanding we would get picked up from our hotel by minivan, then dropped off at the Bus Terminal in Phuket Town, board the 9am bus to Donsak Pier (near Surat Thani), then catch the 3pm ferry arriving at Ko Pha Ngan around 5pm. What really happened is we got picked up as expected on time by a minivan, then we collected a few more people from various other resorts on the island. 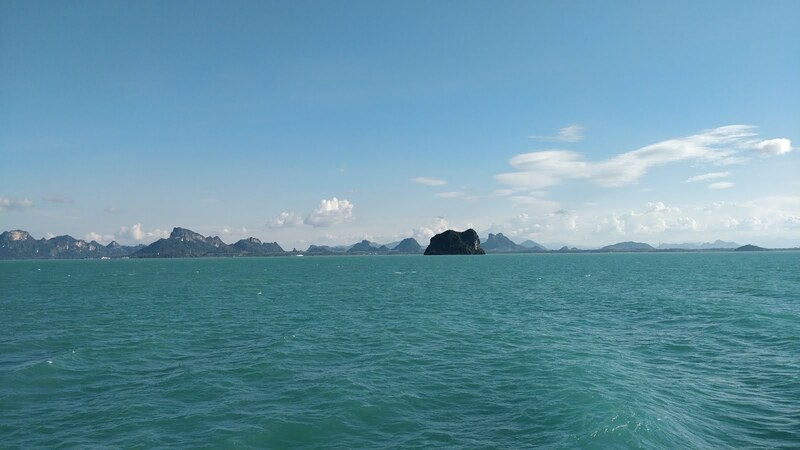 However, by this point I realised we wouldn’t have made the 9am bus, and when I asked the driver, he said he was taking us to Surat Thani and then we would be taken to the ferry by bus. Fine, or so we thought as we drove the 3 hours or so up through some lovely scenery and without a stop, we pulled up at a restaurant/travel shop in Surat Thani. This was apparently to have our tickets checked, given a sticker for the ferry, buy some food/drinks off them and the usual tour tout trying to arrange taxis at inflated prices for when we arrive on the island. We declined this as I expected and had also read they were cheaper to get on arrival there. However, as time ticked by, I was wondering why we were waiting so long as an hour or so passed, and we got closer to having to leave for the 3pm ferry. We waited on more people arriving, and then we got put on a coach to drive to the ferry port at Donsak Pier. 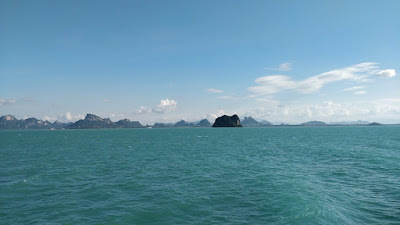 Just as we got near there, we turned off and headed in a different direction and ended up at Laem Thuat Pier which is 10km west of where we wanted to be. We got off the bus, given another sticker and ticket and then just told to wait in another café as the transfer staff disappeared. By now I was wondering what the hell was going on, so Sadie went to ask the café staff when the ferry left. 4.30pm we were told, which is also a slower ferry than the one we thought we had booked and wouldn’t get us to the island till about 7pm... so it seems the transfer company, P.P Service & Transfer had just ignored what we had booked and did it their own way, no doubt due to save costs and try make more commission on everyone. 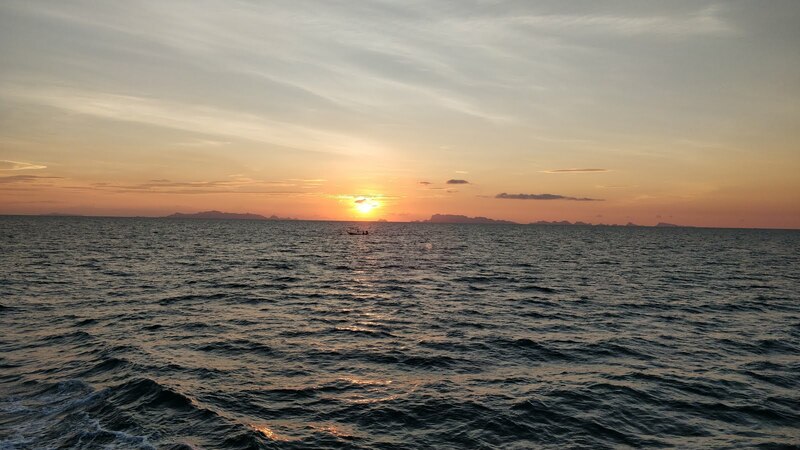 Anyway, after a bit of a wait, we got on the ferry which was a lovely crossing with a quick stop at Ko Samui, and featured a beautiful sunset across the Gulf of Thailand coming down behind some distant islands. 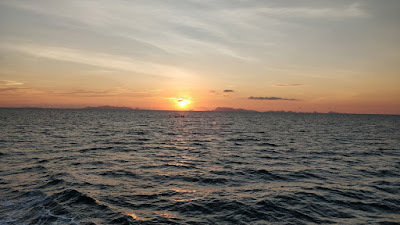 At arrival on Ko Pha Ngan, we asked about a shared taxi (Songthaew) which we quickly got for 200B each, a lot cheaper than the 600B we were quoted by the tout earlier, and went the 20-min journey to our hotel at Salad Beach. The resort we had booked was called Cookies Salad Resort, and as we had paid a good bit over our usual budget, we expected everything to be spot on. Sadly, once we eventually got to our room after 12 hours of travelling in the heat plus being tired and hungry, the aircon didn’t work properly and the shower head wasn’t working either. After a couple of attempts by the young lad who showed us to the room to fix the aircon, an older male came up and tried too, but it still didn’t work properly. It took a bit of discussion, then they eventually offered us another room, but when Sadie went to look at it, it smelt of damp and was also smaller. With time ticking on and us wanting to shower/eat dinner, it wasn’t till after dinner that they eventually found another room for us, but it was just for that 1 night as it was a huge increase in cost and a beautiful room, but sadly wasn’t available for the rest of our stay as we would have been tempted to stay in that one. The next morning, we had a delicious buffet breakfast and then checked that our room had been sorted. Yes, the aircon was indeed fixed, but the shower had to have a new head on it after they checked it again. Our room was huge, with a beautiful view over the bay and a hammock plus seating on our balcony, and with a good selection of food, drinks and cocktails, a pool and a short walk to the beach, we enjoyed our 5 nights here. In the afternoon, we went on to the beach and then went snorkelling, as we had bought a couple of sets back in Patong. This was my first time trying it, and as we got further out into the bay, there was some amazing coral and plenty fish to see. Sadly, my inexperience meant I put my foot down whilst I adjusted my mask and I cut and grazed my left foot. I came back to the hotel to get it cleaned up and then we just lazed about the rest of the day. 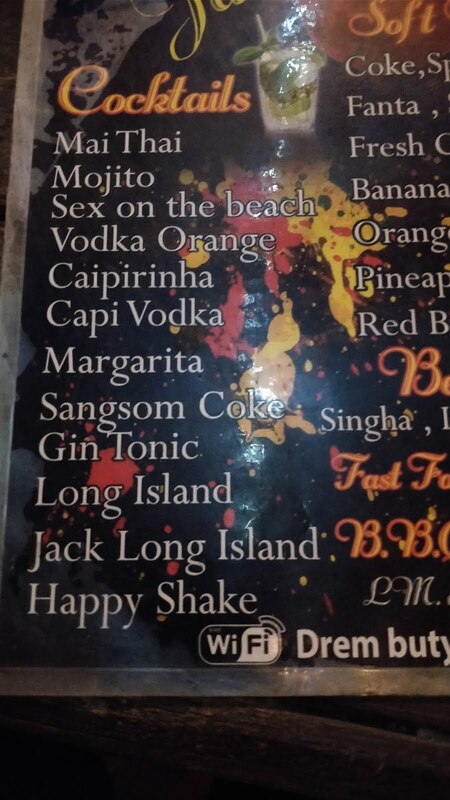 That night we went a walk along the beach, had a couple of drinks at a place called Jacks Bar, which was ran by Jack and his menu offered happy shakes (which we asked and were told contained banana, rum and weed!). We then went to a place called Ying Yang, on the road out from the beach and it was utterly delicious and probably the best/cheapest meal we have had in Thailand. The next day was just another lazy day at the hotel, I spent a little bit of time catching up on paperwork, photos and researching Malaysia briefly, so I can plan our route out of Thailand and Sadie read her book on the balcony. Our bar does happy hour 5-7pm, so we went down for a few cocktails which were the best we have had since Goa. Then we went to look for food, and after walking along the beach, we decided on a place called My Way. We fancied BBQ Seafood and after selecting our dishes and agreeing a price, we waited a little while for it to arrive. Sadly, the food was bland and we didn’t hang around there due to us both getting annoyed at the German bloke who was on the next table and happily kicking sand at one of the beach dogs... so after Sadie had a rant at him, off we went back to Jacks. 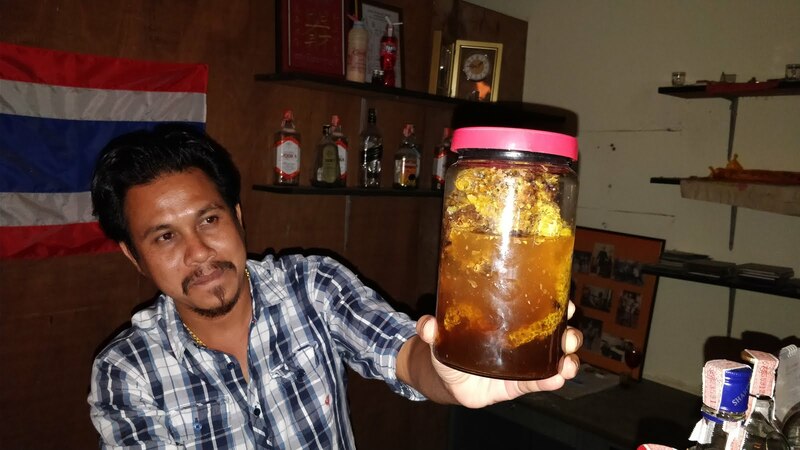 We had a couple of drinks, played some pool and Jack also gave us a taste of his Jungle Juice, which was made with honeycomb and some raw alcohol, so like a moonshine type drink. We both felt quite drunk after that, so headed back to our hotel and went to bed a little dizzy. 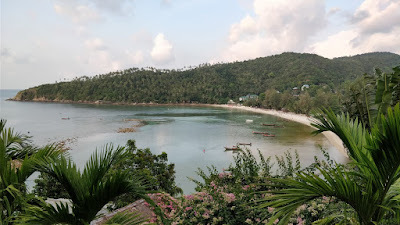 We had booked a shared taxi for the following morning to take us up to Mae Head Beach and the island of Ko Ma, however we were both shattered and decided to go back to bed instead after breakfast and do that trip the following day. 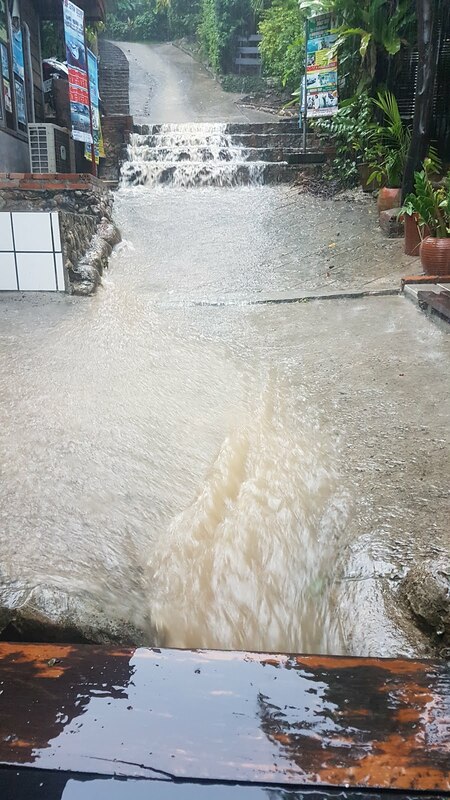 The rest of the day was another lazy one, with torrential rain falling on occasions just for short spells which was pretty cool to watch. We just ate at our hotel that evening and had an early night for our trip tomorrow. The next morning at breakfast it started to rain again, and a quick check of the forecast for the day which was not looking too good, so sadly we cancelled our trip again. 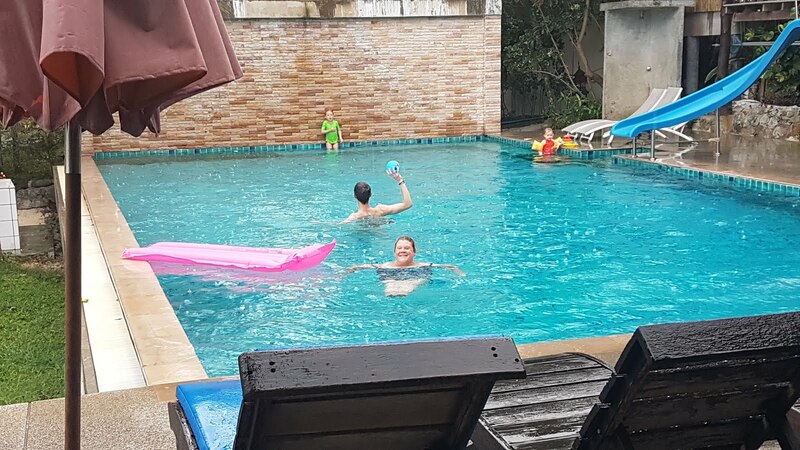 We went down to the pool once the rain stopped, but the heavens soon opened again and Sadie was in her element in the pool and on the beach with the rain falling, as I protected the laptop from getting wet as I looked to plot out a rough itinerary for Malaysia. The rain got heavier, so I retreated to the bar area and we spent most of the day hiding in there as the rain created a river and a waterfall down the main path through the resort. We had a lovely lunch and a couple of beers, then headed back to our room to get ready for dinner. Ying Yang was again our choice as it was so good and cheap previously, and we weren’t disappointed again, and the rain started again so it was back to the hotel for an early night as we had another long day ahead travelling to our next stop of Krabi Town for a couple of nights stopover. This time we had booked our return travel direct on the Songserm website, cutting out any middle-men and the chances for things to go wrong. Our hotel took us and a few other guests to the ferry port and not long after we got on the ferry back to the mainland. A bus was already waiting for us there to take us to Krabi, and it went direct.. even if the driver was a bit rubbish. Arriving at the Songserm office just on the outskirts of town a mere 30 minutes late, we were soon on our way in a minivan to our hotel for 50B each which was nice to see they weren't trying to rip people off. So yeah, the return journey was a lot better than the outward one, lesson learnt and will book direct if possible from now on. It was nearly 8pm by the time we got checked in, so just went to a local place called Gecko Cabane for dinner that I had found on Trip Advisor which was just round the corner, plus it was #4 in Krabi. The food was lovely and after that we just had an early night after travelling all day and being a little sunburnt. 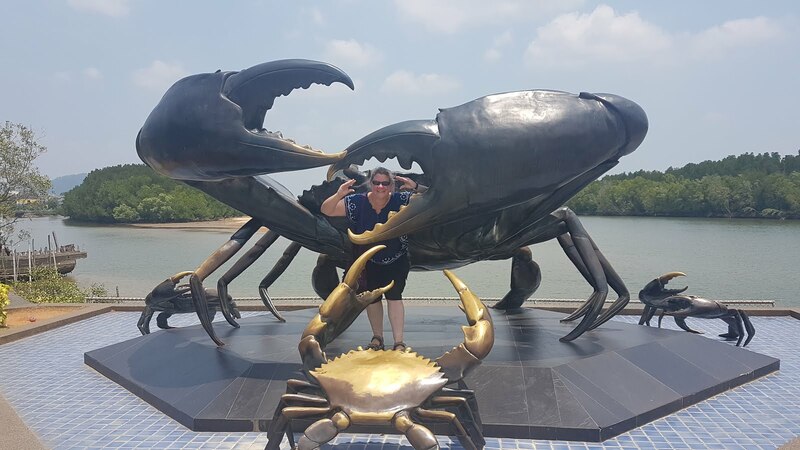 The next day we just chilled a bit, went a walk along the riverside to see some sculptures and then booked our journey to Ko Jum for the following day by minivan then ferry. At night we found a couple of bars doing happy hours and then had another lovely dinner before taking a walk through the night market.